There’s much rage around. The point, though, is to shape a different politics within the mainstream, not outside it. 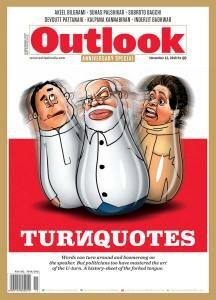 Outlook plucks the best “turnquotes”. We neither seek to mock nor to judge, just to marvel at the yogic skills of the famous. First there came the graphic designer, before his digital superannuation. Rampant miscegenation will now transform his field. Brigade Rd retains its coolness. One-half of Bangalore’s dual self for long, it has seen the city’s chimeric change of colour. On our 23rd anniversary, we decided to showcase some of our best pictures since 1995. Choosing the better among the best was not easy. So after looking at archives full of brilliant pictures, we shortlisted 23 photos for you.